I try to stay plugged into the local Philly Film Scene, but it's easy to get caught up in the new box office releases and miss some good stuff going on around me. I did make it to a couple of XPN Music Film Film Festival (click for post) screenings and events, but I completely dropped the ball when it came to Cinedelphia's Film Festival. Thanks to T & T's new blog contributor Chris "Flood the Drummer" Norris, I did attend opening night of the The Filadelfia Latin American Film Festival (held April 27-28, 2013). Chris' grandmother is one of the organizers of this festival, now in its sophomore year. Don't they look cute together! 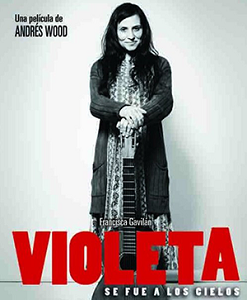 The opening night film Violeta Se Fue a Los Cielos (Violeta Went To Heaven) Directed by Andrés Wood is a creatively told biopic on the life of Chilean folksinger, artist and activist Violeta Parra, who basically was so driven by her passions, she completely destroyed two marriages and woefully neglected her 3 children. Undeniably, she was a force to be reckoned with, right up until she selfishly committed suicide. Chris's piece below paints Violeta in a much better light; however, we both agreed, it's an organic and noteworthy film. 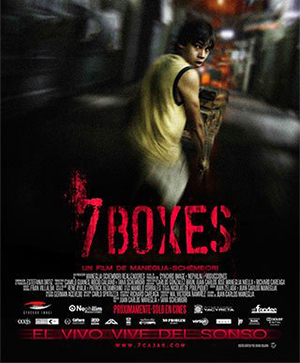 7 Boxes by filmmakers Juan Carlos Maneglia & Tana Schémbori was a hit! So original! Part crime drama, part crazy farce, part morality tale on the pitfalls of greed and need for fame. 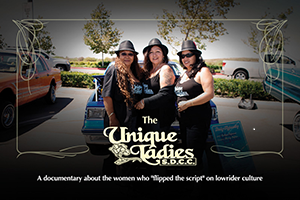 Growing from one feature film to nine, the Filadelfia Latin American Festival (FLAFF) opened its second year this weekend at the International House with a presentation of Filmmaker Gloria Moran’s “The Unique Ladies,” San Diego’s only all women’s lowrider car club. The event also featured the Philadelphia Premiere of "Violeta Went to Heaven,” a Sundance winning film that tells the extraordinary story of Violeta Parra, a folksinger and pop culture icon. Expressing the soul of her nation through song and protesting social injustice wherever she saw it, “Violeta Went to Heaven” traces Violeta’s evolution from impoverished child to international sensation to Chile’s national hero, while capturing the swirling intensity of her inner contradictions, fallibilities, and passions. With over 15 hours of film being shown during the two day period, the latter being held at Gershman Hall, University of the Arts, FLAFF spotlights the struggle, oppression, marginalization, and hope that are not unique to the Latin American culture, but are present in other cultures as well. “This year’s program offers an assortment and timely selection of both new and old voices. This year’s line-up goes beyond telling Latin American stories; they narrate the human experience,” said Beatiz Vieira, co-Founder of FLAFF. Lemon is working on a new project wherein the blaxploitation character “Dolomite” is placed in Attica during the uprising. 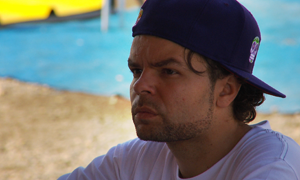 The three-time felon and former drug dealer became a victim to his circumstances at a younger age; however, he now fully understands the transformative power of the arts and is part of a movement to bring more Latin American stories to the stage. Renowned Filmmaker Sonia Fritz is responsible for Yareli Arizmendi’s, who’s referred to as “The grand dame of Latin cinema,” return to the big screen in the highly anticipated movie America; also staring Edward James Olmos, Limary Nadal and Yancey Arias. 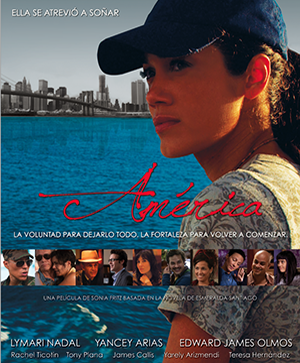 Based on the book by Esmeralda Santiago, America is a story about a young woman (same name) living in Vieques, P.R. during the American Naval occupation of the island. She is constantly physically, sexually and mentally abused by her husband Correa. Determined to change her life and save her child, she decides to move to New York where she will raise money working as a nanny and eventually be able to send for her daughter. “Her relationship was mirroring the colonial relationship between Puerto Rico and the United States. The bombing was happening because of the colonial situation in Puerto Rico. So many people have cancer, the island has been polluted and the fishing is terrible, all because of the military occupation. Even tho they (military) left, there are still life bombs and they haven’t cleaned up as they should do. So in a way, the abuse portrayed in the film was a metaphor for the abuse the island suffered, and still suffers,” explained Fritz. After touring Montreal, Morocco, Mexico and Turkey, America will make its first commercial opening on the East Coast debut in Bridgeport, CT., at the Bijou Theater. This sizzling hot weekend wouldn’t have been possible without the generous support of: The Philadelphia Foundation, The University of the Arts, Greater Philadelphia Film Office, International House Philadelphia, Case de Duende, Leewawy Foundation, Congreso, Health Partners and Bread and Roses.